The Retinomax is a full function handheld autorefractor that can be used anywhere. Measure patients in any position, in a hospital bed, in a wheelchair or in your pre-test room. Great for screening at a school or nursing home. Battery operation eliminates the limitation of being plugged in and allows functionality anywhere. The Retinomax has full measurement range and advanced measurement modes. The instrument begins readings the instant that alignment and focus is achieved and measurements are terminated automatically when complete. Faster measurement times are complemented by increased accuracy. A retroillumination function highlights media opacities. The elimination of the chinrest makes the examination procedure easier, more relaxed and fun for children. A melody function makes the Retinomax perfect for even the smallest children. Simultaneous refraction and keratometry measurements. 4 peripheral measurements can be obtained with minimal change in measurement time and no additional steps for the operator. 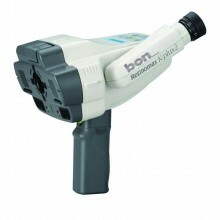 Click the button below to add the bon Retinomax K plus 3 Hand held mobile Autorefracto Keratometer to your wish list.